If you’re not familiar with kelp noodles, they are made out of seaweed and traditionally used in Asian cuisine. They are a good source of iodine, gluten-free, and super low in calories. Because they have a neutral taste they can be used in a variety or recipes. My favourite part is they’re a breeze to prepare. They can be enjoyed crunchy straight out of the bag or they can be soaked until softened, which is my preference. 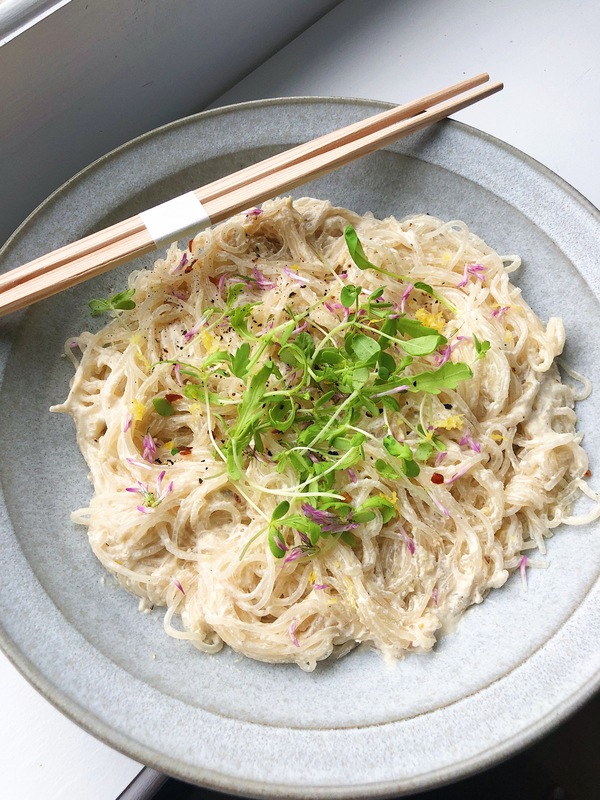 You can find kelp noodles at Whole Foods, health food stores, or Asian grocers. I buy Sea Tangle Noodle Company kelp noodles. My super creamy sunflower seed sauce gives these low calorie noodles some substance and healthy fats. The sauce requires a few ingredients and can be whizzed up in your blender in seconds. You can also use this delicious sauce for other noodle recipes. Place the kelp noodles in a bowl and cover with hot water until just submerged. Stir in the juice of 1 lemon and a teaspoon of salt. Allow to soak for at least 1 hour or overnight. The longer the noodles sit the softer they will get. Rinse and dry noodles before using. Cut if necessary. Soak the sunflower seeds in water for at least 30 minutes or overnight. Drain before using. Zest the remaining lemon and set the zest aside. Place the sunflower seeds, 1/2 cup water, juice of zested lemon, miso, and olive oil into a high-speed blender. Blend until very smooth. Stir in the lemon zest, chili flakes, and season with salt and pepper. Combine the noodles and sauce. Garnish with microgreens if using. Serve at room temperature. This entry was posted in Starters/Sides and tagged blender recipe, dairy-free, easy recipe, edible flowers, gluten-free, grain-free, healthy, kelp, korean, microgreens, paleo, plant-based, seaweed, seaweed noodles, seeds, sunflower seeds, Vegan, Vegetarian, vitamix. Bookmark the permalink.